Atomos has released a new AtomX Sync module for the Ninja V monitor recorder at IBC2018. At just $149, it brings professional, long range, wireless timecode and genlock to any HDMI source, including DSLRs and mirrorless cameras. There is also simultaneous Bluetooth connectivity for Ninja V app control, and additional sync functionality using Bluetooth to any compatible video, audio device or smartphone app. AtomX Sync makes it easy to integrate large sensor consumer cameras easily into traditional live productions. All captured video will share a common frame-accurate timecode that can be recognised by all mainstream NLEs. The module docks directly into the Atomos Ninja V monitor/recorder’s modular expansion slot and is fully controlled and integrated with the AtomOS operating system and touchscreen interface. Users can remotely control and configure other Ninja V recorders equipped with the module on the same network up to 300m away. Operating on sub 1GHz frequencies (865.05 to 923.2MHz) enables great range even in crowded environments. 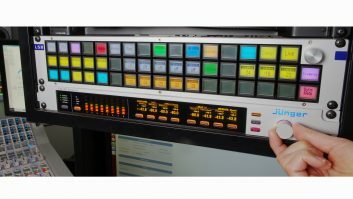 The system is equally at home in large scale multi-camera productions for sporting events and concerts, or simply being used to sync a mirrorless camera to a Timecode Systems equipped audio device for perfect automated sync sound. AtomX Sync also has a built-in battery extender that allows for continuous power for up to seven minutes when swapping batteries, ensuring uninterrupted operation of the Ninja V during a shoot. Together with the Atom X Ethernet/NDI module also launched at this year’s IBC, the AtomX Sync module is the first in a series of AtomX solutions to come. AtomX modules dock into the battery slot, and multiple modules can be stacked passing power and offering advanced connections and functions.